Here in NC, we are rapidly approaching the Gap Season, where summer crops are tapped out or on the way out and fall crops haven’t yet started producing much. How could that be??? Didn’t summer just start, like, yesterday? I love summer–even with the mosquitoes. I’m feeling a little sad about the gap, really. I feel like I have so much unfinished food business. I have tomato and eggplant and zucchini recipes to try, more tomato sauce to freeze, and I’ve only had okra a few times this summer. Still not sure how that happened. Fortunately, the summer season tapers off gradually and I have a couple of weeks to get my act together before the gap. I’ll be stocking up on what I can this week and next. Mostly peaches, green beans, okra, tomatoes, summer squash and zucchini…any other suggestions? While I finish canning and freezing our summer bounty, I am excited about one thing. Football. Fall means football, which also means stews and chilis and braised short ribs. It also means sweet potatoes and pumpkin and collard greens. If there is one thing I have realized on our journey (and trust me, there is more than one), it is that when you eat local, you genuinely appreciate the sweetness of each growing season and the importance of paying attention to what is available to you at any given time. I will miss fresh, ripe peaches, but not enough to buy their tasteless, black-hearted cousins at the grocery store. I do, however, have 18 half pints of peach butter and 4 quarts of peach halves that I will ration out over the next year, and that will be enough to sustain me until peach season comes again. Had I known how to cook, I probably could have made better use of those figs. If I had known about THIS recipe from my friend Heather at Sugar Dish Me, I would have totally made that (and I will as soon as I get me some more figs!). Figs are just coming into season here in central NC and I plan to sock away as many as I can. 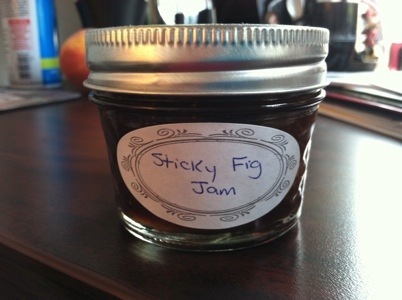 I found this recipe for sticky fig jam in “Put ‘Em Up” (LOVE this book) and it is absolutely delicious. The blend of figs and balsamic vinegar is pretty amazing. It’s great on toast, but we have enjoyed it on pork tenderloin, on pizza, over cream cheese as a dip and on grilled cheese sandwiches as well. Figs are also one of those great fruits that can be frozen whole for up to 6 months, so if you can’t decide what to do with them, just pop them in the freezer! If you are lucky enough to live in a region of the country (or world) that produces tree and ground nuts, you have cause to celebrate! Nuts are high in protein, fiber and nutrients and while some may pack a wallop of fat, that fat is typically good for you and your body (as long as you are not allergic!). Some nuts, like pine nuts, pecans and walnuts can go rancid quickly when stored, especially in warmer climates. So how do you make the most of your local nut harvest and save your harvest for the future? Here are some great ways to make the most of locally and/or sustainably produced nuts. Did you know you can freeze nuts for about a year? Put shelled nuts into freezer bags, label them with the date and tuck them into your freezer for later! No need to blanch them or do anything special–just pop them into bags! I do this with our local pecans all the time. Freezing them prevents that “off” taste when they’ve been sitting too long, and the ease of freezing them encourages me to stock up with new crop pecans when they are available at my farmer’s market. If you are fortunate to end up with, say, 10 pounds of local almonds (I WISH! 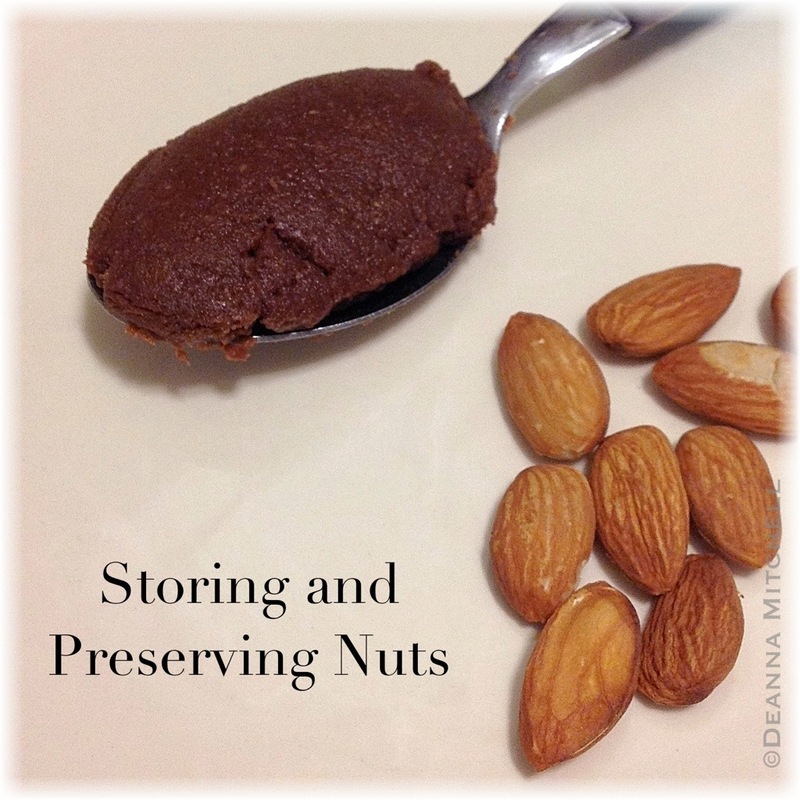 ), one way to keep them at the ready is to make your own nut butter. When I was a child, peanut butter was the only nut butter around, but now you can easily find cashew butter, almond butter, sunflower butter and more. Some are even flavored. Did you know it takes about 30 minutes to make your own healthy nut butter at home? Put 1-2 cups of nuts (I use raw nuts, but roasted will work, too) in a food processor. Process at high speed, giving your food processor a break every minute or two, for anywhere from 15 to 25 minutes or until the nuts release their oils and you have something that is spreadable. This will vary widely depending on the type of nut and how much oil it has in it. you will end up with something amazing. And healthy. And delicious. Add some nut oil to hazelnuts (they can be a bit dry) and salt, if you like. Sometimes I add a bit of coconut oil to nut butters that end up on the dry side. Nut butters are very forgiving–if you add too much of a flavoring, just add more nuts. Need more flavoring? Add more and blend again. Easy! I don’t refrigerate my nut butters–they are gone quickly, and I find refrigerating them makes them difficult to spread. However, you can refrigerate or freeze most nut butters. You will probably eat them up long before they go bad, but refrigerated nut butters will keep for several months. Frozen nut butters for at least a year. The oil may separate during thawing, but just mix it all up and you’re good to go! For more great nut butters and yummy ideas for using them, see www.mywholefoodlife.com. Another blogger with some awesome, healthy recipes! 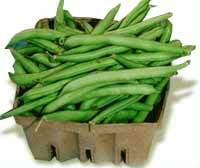 But putting up food for the winter months includes freezing and drying foods, too. I still don’t have a deep freeze, but I did manage to put up a LOT of strawberries this spring. Where are they? They have all been eaten–mostly turned into fruit/yogurt smoothies, which we have every morning. It make me realize just how much fruit we plow through each week. ARRGGHH. So, come winter, I will not have strawberries. I am, however, going to try again with peaches, blueberries and blackberries. And I’ll try some vegetables as well. Yesterday while waiting for my marinara sauce to cook, I blanched and froze some summer corn and some green beans. I’m on my way to rebuilding my stock of foods for winter–not that we mind kale, collards and sweet potatoes, but won’t it be nice to have fresh tasting corn as well? As long as we don’t have corn smoothies, I think we’ll be more successful with vegetables! I am, overall, not a fan of standard tomato ketchup. Tomatoes, I love. Ketchup? Not so much. It’s too sweet for me and tastes nothing like the juicy summer tomatoes I adore. I found this recipe for a roasted red pepper ketchup that is so far superior to store bought ketchup that it almost needs a new name. It is full of tomato flavor, but also spicy. I canned a bunch of it and we have used it on pork chops, beef, hamburgers and potatoes. It is awesome. Is it obsessive to make my own ketchup? Maybe. Will you become obessive after you try it? Most likely. Yes, it’s that good. This recipe is derived from Put ‘Em Up by Sherri Brooks Vinton. Prepare an ice-water bath in a large bowl or clean sink. Bring a large pot of water to a boil. Drop the tomatoes into the water, no more than 1 pound at a time, and return to a boil. Blanch for 1 minute. Scoop the tomatoes out of the water with a spider or slotted spoon and plunge them into the ice-water bath. Continue blanching the tomatoes in batches. Remove from the ice bath and drain. Peel, core, and crush the tomatoes. Heat a grill. Coat the red peppers lightly in olive oil and put on the grill on medium heat. Let peppers char and turn every few minutes so all the sides of the peppers are charred and blistered. Remove peppers from the grill and put in a large paper bag (a grocery bag works well). Close the top of the bag and let peppers sit for about 10 minutes. Remove peppers from the bag and let cool. Slip the skins off the peppers, remove the stems and seeds. Roughly chop the peppers. Combine the tomato pulp, peppers, onion, vinegar, brown sugar, salt, garlic, allspice, cinnamon, and cloves in a large nonreactive saucepan and bring to a boil. Reduce the heat and simmer for about 10 minutes, until the onions are translucent. Remove from the heat and puree with a stick blender. Return the puree to the heat and simmer over low heat until thickened, about 2 hours. Refrigerate for up to 3 weeks or can using a boiling water bath. To can, ladle into clean, hot 4-ounce or half-pint canning jars, leaving 1/4 inch of headspace. Release trapped air. Wipe the rims clean; center lids on the jars and screw on jar bands. Process for 15 minutes. Turn off heat, remove canner lid, and let jars rest in the water for 5 minutes. Remove jars and set aside for 24 hours. Check seals, then store in a cool, dark plance for up to 1 year. While this jelly won’t earn any ribbons for beauty at the State Fair, it is delicious, full of flavor and would be good on a biscuit or on a pork tenderloin. The reason it isn’t crystal clear and sparkling, is because I use a food mill instead of cheesecloth to extract the seeds. This leaves in some of the fruit pulp that makes the jelly opaque instead of clear. I don’t care. When I have blackberries, I’m using every little bit of them I can! Rinse the berries and put in a nonreactive stock pot. Add the water. Mash the berries with a potato masher and bring to a boil. Reduce heat and simmer for about 10 minutes. Let cool about 5 minutes. Put a food mill with a fine blade over a large bowl. Fill the food mill half way with the cooled blackberry mixture. Process until there are just seeds remaining and dump the seeds into a container for composting. Continue until you have processed all the berries. Pour 3 cups of the processed blackberries into the pot and bring to a boil (NOTE: if you have more than 3 cups of processed blackberries, adjust the amounts of the remaining ingredients accordingly). Add the calcium water and bring to a boil again. Mix the pectin and sugar in a bowl. Add to the boiling blackberries and stir until sugar is dissolved. Remove from heat and cool for 5 minutes. Scrape off any foam. Either refrigerate the jelly or ladle into clean, hot half-pint jars and process in a hot water bath for 10 minutes. Turn off the heat and allow jars to rest in the hot water for 5 minutes. Remove from the canner and set aside. Check seals after 24 hours and if seals are good, store for up to 1 year. So last week, I found myself the happy owner of a 30 pound box of canning tomatoes. YES! 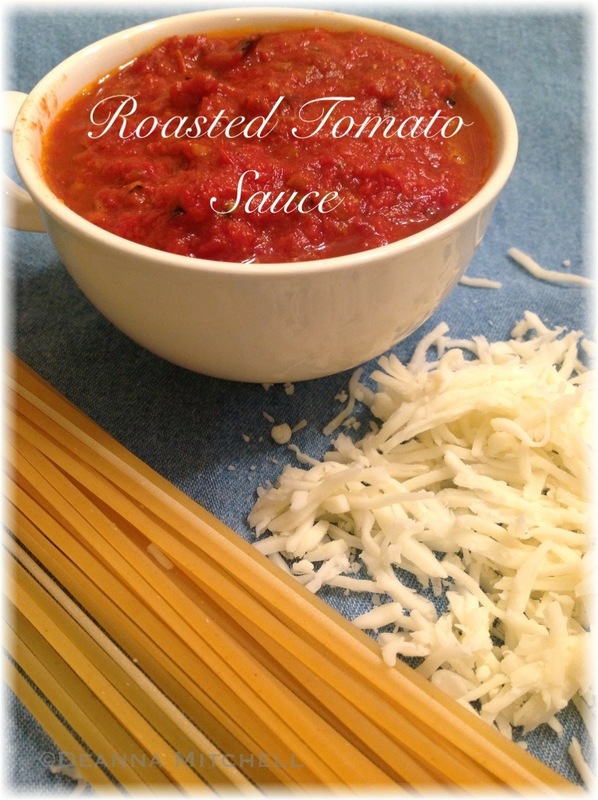 I knew exactly what I wanted to do with them–make this wonderful tomato sauce. Calling this “sauce” is a little inaccurate. This is so thick and fragrant and rich tasting, it should just be called “summer joy”. I could eat this with thick pieces of bread, over pasta, in chili, in soup or just plain ol’ by itself with a spoon. With only three ingredients, it is super healthy. No sugar, no preservatives, no salt. Just sunny, summer tomatoes, garlic, and a splash of olive oil. I keep this sauce simple so I can use it in any recipe later. This “summer joy” is easy to make–just chop, roast, blend and freeze! Instead of canning, you just fill quart freezer containers and stash in your freezer for later. We went through 8 quarts last winter! I made four quarts from my box and at $10 per box of canning tomatoes, that is $2.50 per quart of homemade greatness (plus a teensy bit for the garlic and olive oil). I’ll make some more soon! If you love tomato sauce, but don’t want to bother with canning, try this! Romas are best for this sauce as they have less water, but any tomato will do–you will need to adjust your roasting time for very juicy tomatoes! Wash and trim tomatoes, and cut into halves (romas) or quarters (for larger tomatoes). Preheat oven to 400 degrees. Line one or more baking sheets with foil. 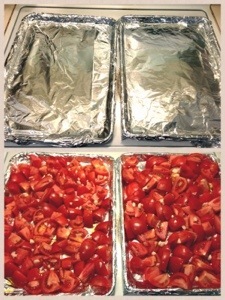 Put tomato pieces on a foil lined baking sheet (I use 2 sheets at a time). Sprinkle garlic pieces over tomatoes. 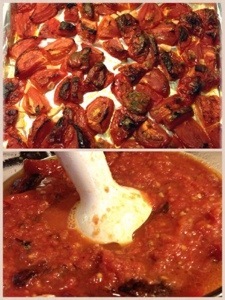 Put baking sheet in the oven and roast tomatoes for about 2 hours. Check on them periodically and stir them around a bit. Roast tomatoes until the liquid has evaporated and the tomatoes are a bit charred and shriveled. Put all tomatoes and garlic pieces in a bowl. Use an immersion stick blender and puree the tomatoes until they are to your liking. I like mine fairly chunky, but you can make this as smooth as you like. Store in freezer safe containers in the freezer for up to 6 months. Blueberries are awesome little powerhouses of nutrition. 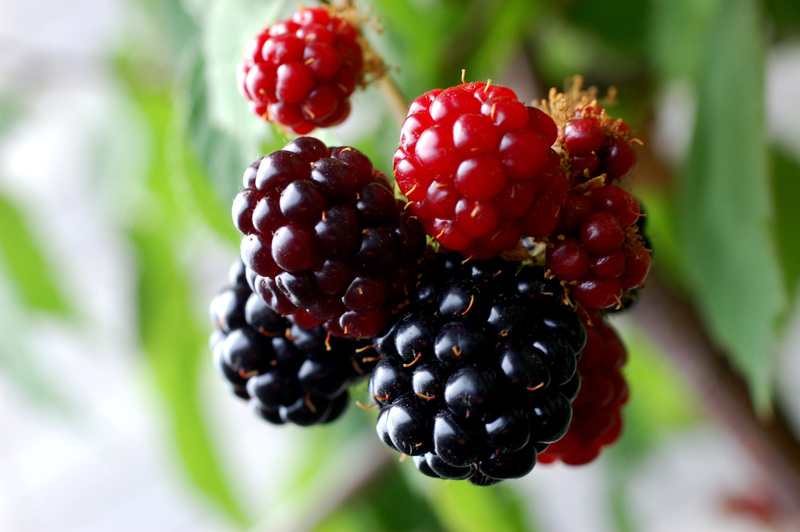 High in antioxidants, fiber and vitamins, they are sweet little health heroes. For me, as much as I like blueberries, I tend to like them better when paired with another flavor. Unlike our local blackberries, blueberries are just a bit too sweet for me. When partnered up with a more tart flavor, their sweetness is a bit more in balance. 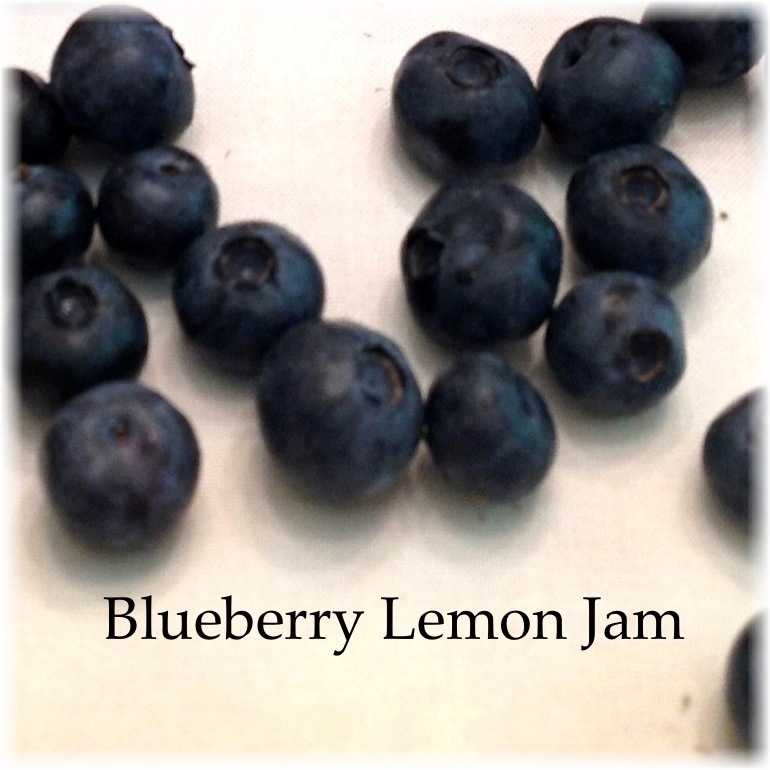 I love the combination of blueberry and lemon (and our blueberry-rhubarb combinations this spring were terrific also). So this weekend, I made a new jam experiment with just blueberry and lemon. The result? I think the blueberries taste far better in this jam than in plain blueberry itself! The lemon and lemon zest really brings out the brightness of the berries. This is a keeper! One of the wonderful things about making jam with blueberries is that a lot of the work is done for you. Unlike strawberries, which require hulling and chopping, blueberries just need a quick wash and a check for any remaining little stems and you’re ready. Also, blueberries have a lot of natural pectin, so you don’t have to use any pectin at all, unless you’re in a hurry. This recipe uses two kinds of lemon juice–bottled lemon juice (this is to provide enough acid in the jam that the jam will remain shelf stable) and fresh lemon juice and zest (for fresh lemon flavor). This is one place you want to buy an organic lemon. Actually, any time you are zesting citrus, you want to use an organic or pesticide-free fruit because you are using the part of the fruit that is most exposed to pesticides and toxins. Fill a canning pot with water, insert the rack and add 6 half pint canning jars. Heat over high to boiling, then turn off heat and let sit until you are ready. Wash the blueberries in cool water and pick off any remaining stem pieces. Put the washed, wet blueberries into a non-reactive stock pot and heat over medium. Mash berries with a potato masher several times while cooking. When blueberries and juice come to a low boil, add the sugar, lemon juices and zest. Stir well to dissolve the sugar. Turn heat down a bit and keep blueberries at a low boil, stirring frequently, for about 45 minutes or until the berry mixture gels. Remove hot jars from the canning pot (carefully!) and set them on a clean tea towel. Put the jar lids into a bowl and pour some of the hot water over them to cover. 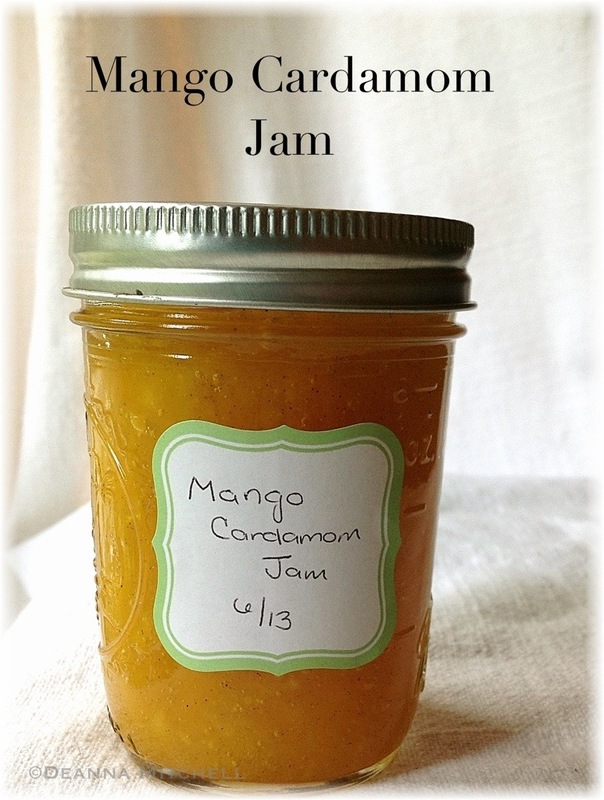 Carefully ladle jam into the hot jars, leaving 1/4″ of headspace. Add lids and bands, just tighten bands to finger tightness. Return the filled jars to the canning pot, cover pot, and heat over high to boiling. Boil for 10 minutes. Turn off heat, remove cover, and let sit for 5 minutes. Remove jars from the hot water bath and let sit undisturbed for 24 hours. Check seals and store in a cool, dry place for up to 1 year. **You can use fresh lemon juice, but because bottled juice is more consistent in its acid content, the bottled stuff may be more reliable. I love homemade jam on my Ezekiel Bread for breakfast, but I also love to bake, grill and roast with jam or just dump it all over a hunk of cream cheese and eat it with crackers. YUM. All our jams are low-sugar (not sugar substitute) and they have lovely, intense flavors that pair well with meat, fish, cakes, muffins, etc. I’m even experimenting with using them in popsicles! In a bowl, combine the sugar and pectin. Set aside. Make the calcium water, if you aren’t using some that is already prepared. Set aside. Put peeled, pitted and chopped mango into a non-reactive stock pot along with a splash or two of water. Heat over medium, stirring often to prevent sticking. When mango has cooked about 3-4 minutes, use a potato masher to mash the mango (I also use a stick blender to really get all the larger pieces mashed). Add the calcium water, lemon juice and cardamom to the pot. Stir well. Add the sugar/pectin mixture slowly to the pot. Stir well until sugar is dissolved. Bring mixture to a low boil. Stir pot and pull pot off the heat. Let mixture sit for 5 minutes. Remove jars from the canning pot (carefully!) and set them on a clean tea towel. Put the jar lids into a bowl and pour some of the hot water over them to cover. Ahhhh, strawberries!!! Always a welcome sign of spring. We are sadly coming to the end of our short, but sweet, strawberry season, but we have plenty of berries put up for later (yay!). 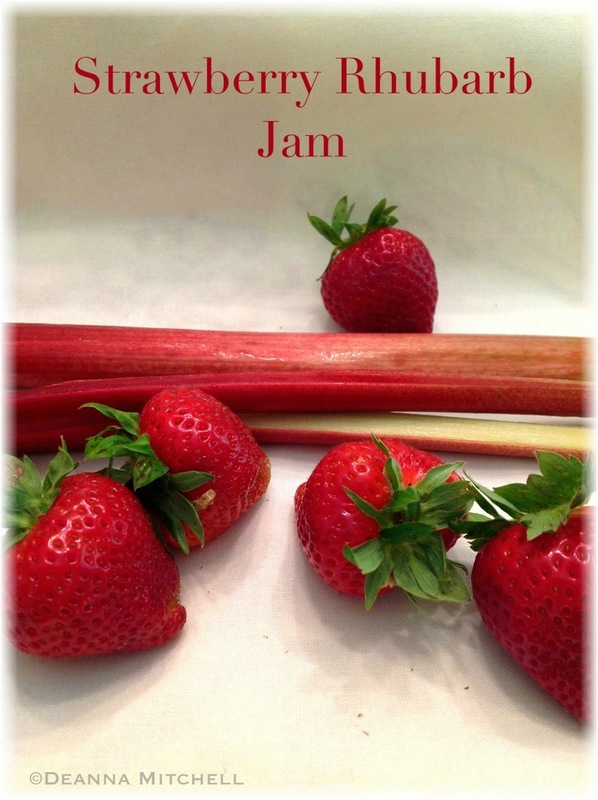 I had never made strawberry rhubarb jam, but I love that combination, so I gave it a shot. I’m not sure I’ll ever make regular strawberry jam again!!! I like it so much! The tartness of the rhubarb is terrific in brightening up the sweet jam. This recipe is adapted from the Pomona’s Universal Pectin website. Fill a canning pot with water, insert the rack and add 4 half pint canning jars. Heat over high heat to boiling, the. Turn off heat and let sit until you are ready. Add chopped rhubarb to a stock pot with a little water and heat over medium, stirring frequently. Cook until soft. Add chopped strawberries and cook 1-2 minutes. Add butter. Mash berries with a potato masher and continue cooking. Add lemon juice and calcium water and stir. In a small bowl, combine the sugar and pectin. Slowly stir the sugar into the berry mixture. Bring to a boil. Turn off heat and let berry mixture sit for 5 minutes.